For full disclosure, I met Kelli a few years ago through a family function. Who knew then that a few years later, she would accidentally find me at a bridal show. 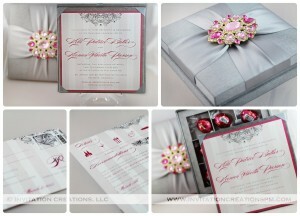 She told me she wanted to do a silk box invitation. 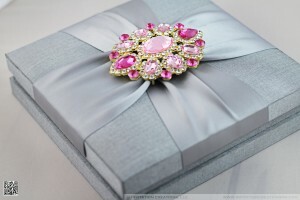 She wanted a WOW invitation and that is where her heart stayed. Many who have done any research on them know that these little beauties have a pricetag that makes you say WOW too! I had done a silk folio before but not a silk box and I was excited at the prospect of doing this together. The final product was nothing short of over-the-top! And yes!! Those silked Box beauties came with chocolate inside of them! Talk about details, huh? 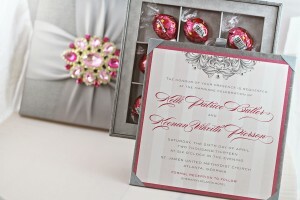 We did three inserts for this invitation. For the response card, we did a response postcard with a custom stamp of course. Kelli didn’t want a single details to be left out. I LOVED working on this project! It was such an honor to collaborate with her on this project. Thank you, Kelli! I wish you only happiness and much success in your marriage as well as in your life all around! Muah!